Aww, that's such a sweet pic! Now that's a REAL daddy! Not much is cuter than that!!! If ya keep posting the adorable pictures, you are only going to fuel my crush LOL. Daddy's little girl for sure! This is the most beautiful picture to me. 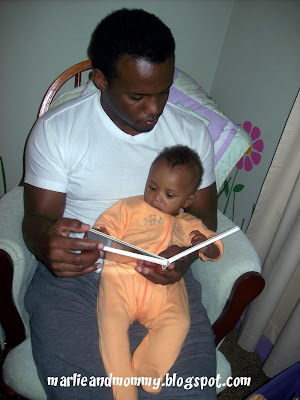 Love seeing fathers reading to their children! She looks like she's paying such close attention. Smartie pants! Glad things are going better with your poochie! the most precious time of the day I think! Another picture that should be framed. That is so precious.